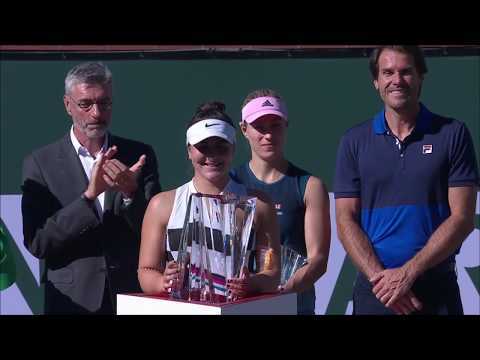 Bianca Andreescu capped a superb weekend for the Canadian Fed Cup team by defeating Arantxa Rus of the Netherlands 6-4, 6-2 on Sunday to vault Canada into an April playoff with a chance to be promoted to the elite eight-nation World Group I in 2020. Following her 6-4, 6-1 victory over Richel Hogenkamp and Francoise Abanda’s 7-6(8), 4-6, 6-4 win over Rus on Saturday, Andreescu’s result Sunday gave Canada and insurmountable 3-0 lead in the best-of-five match World Group II Playoff. To put a bow on matters, Gabriela Dabrowski and Rebecca Marino saved three match points in a pro forma fourth doubles match – winning 2-6, 7-5, [12-10] over Dutchwomen Demi Schuurs and Bibiane Schoofs. Andreescu has been a dynamo in 2019. Starting the year at No. 178, her inspired performances in Auckland (runner-up), the Australian Open (qualified and second round) and Newport Beach, California, (her first WTA title) have not gone unnoticed as she climbed as high as No. 68 in the January 28th WTA rankings. It had to be tough for Rus, especially after the disappointment of her hard-fought match with Abanda on Saturday. But in the very first game it was obvious that Andreescu plays at a pace that she was unaccustomed to – and that she would have a lot of difficulty dealing with it. Andreescu quickly led 3-0 but had a mental lapse that allowed Rus back to 3-all before she completely took over the match and closed out the lanky No. 129-ranked Dutchwoman in 69 minutes. It’s written on the Fed Cup website that Andreescu’s coach is Frenchwoman Nathalie Tauziat – a player-coach partnership that has been over for a while. When a Dutch reporter asked her about who her actual coach is, that led into some fun-and-games, back-and-forth involving Wikipedia. So it was an ideal weekend in ’s-Hertogenbosch, Den Bosch or whatever you choose to call it, for captain El Tabakh. The Canadian women, led by the preternatural Andreescu, were simply better than their opponents. Some will point out that Dutch No. 1 Bertens did not play. No doubt she could have made a big difference. But Canada was without Genie Bouchard who could have played a key role in either singles or doubles. It remains to be seen if she will be available for the next round to be held April 20-21 – the opponent and a site to be determined by a draw at the International Tennis Federation headquarters in London on Tuesday. A week ago in Slovakia, two teenagers – Denis Shapovalov, 19, and 18-year-old Felix Auger-Aliassime – led Canada to victory in a Davis Cup qualifier in Bratislava. As impossible as it might seem, eight days later another teenager, Andreescu, 18, was the key to a Canadian victory in a Fed Cup World Group II Playoff in the Netherlands. It’s pretty remarkable and Canadian tennis fans should it enjoy it while they can. It’s not something that’s likely to happen again in most peoples’ lifetimes. At the end of World War II, Canadian soldiers – with more than 7,000 dying – liberated the Netherlands from Nazi Germany forces. Before the matches on Sunday at the Maaspoort arena, the video board carried the above message. It had a few Canadians a little choked up to see that – 75 years later – the Dutch people had not forgotten. This work by American artist Paul McCarthy was commissioned by the city of Rotterdam in 2001. The ‘Santa Claus’ sculpture has caused a lot of controversy with people seeing different things in what is supposed to be a pine tree in the right hand. ‘Santa Claus’ stirred strong hostile feelings in some locals, while others were great defenders. It moved around a few times but finally found a home in the Eendrachtsplein in the commercial district in November, 2008.